We started our journey at 3-45 pm from Bangalore towards Bandipur, enroute we reached Mysore had a beautiful dosa at Mylari Hotel in Mysore and reached Gundlupet and we stayed at PWD IB at 09-30 pm had Dinner,went to sleep. We decided to go exclusively in the private vehicle as we approached and requested DFO Office, Manager said I cannot arrange private vehicles inside the forest, I will get you a vehicle and arranged a Office Tata Sumo Vehicle. We had lunch and had took a small nap and fresh’n’up we reached the Reception Counter, Our Vehicle Tata Sumo with Driver Cheluvaraju was waiting, we entered the forest safari as soon as we entered we found Elephant with calf’s after taking some snaps we had moved towards shooting spot Driver Cheluvaraj Spotted a Leopard Saying "Chirathe Sir Chirathe” it was attacking something as soon as we stopped our vehicle we took some good snaps within a few minutes it went inside the bushes we followed to trace where the Leopard went and waited nearly 10-20 mts it was inside the bush r else it was moved to another place and finally we came back same route where the Elephant with Calf still there and had a nice view of Indian Guars rest again same peacock, mongoose etc, we came back to our Cottage had Dinner and Slept with We decided to go 2 continuous trips to the sanctuary next morning with the same vehicle. Early morning we approached DFO, he informed that he cannot arrange the separate vehicle or private vehicle to enter Forest and asked us to take Gypsy which cost Rs. 3500 per trip and requested to get one trip with the same vehicle (TATA SUMO) in the evening by 3-00 pm and he instructed the Official there to arrange the evening safari with the TATA SUMO vehicle for us. Again we had decided to have continuous trips in the VAN for safari with the same Mr. Sebastian Vehicle nothing spotted except the same mongoose, deer’s and peacocks and came back from Safari after having breakfast we decided to move towards Gopala Swamy Betta, We reached GS Betta by 11-00 am had darshan of Sri Venugopala Swamy and met priest over there who was a good friend of us, he performed special pooja for us and had a prasadam over there we had captured some good landscapes from there we came back and had Lunch. At 3-15 pm we reached the Reception Counter waiting for the Vehicle, as that Vehicle was not there as it was been directed to deliver ration to the Anti Poaching Camps, we waited upto 5-00 pm no sign of vehicle, dejected over, and after having tea at local tea shop, went towards Border of Karnataka-Tamilnadu (Kakkanahalla) on the Ooty road from Bandipur. 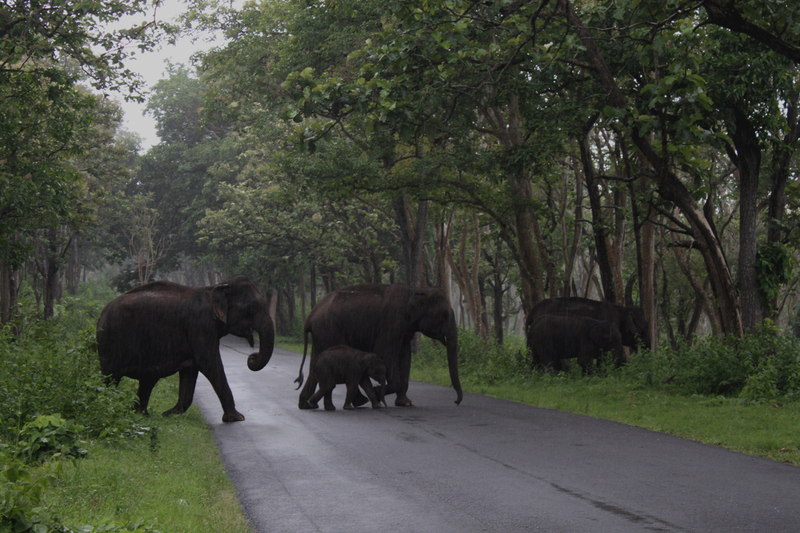 We saw a herd of Elephant with calf on the road side and a big herd of Indian Gaurs (nearly 30-40) soon lightning and a drizzle of Rain started, we took some good snaps of Elephant Crossing the Road. Bandipur Tiger Reserve situated in Mysore District of Karnataka State of India was among the first nine Tiger Reserves created in India at the launch of Project Tiger in 1973. 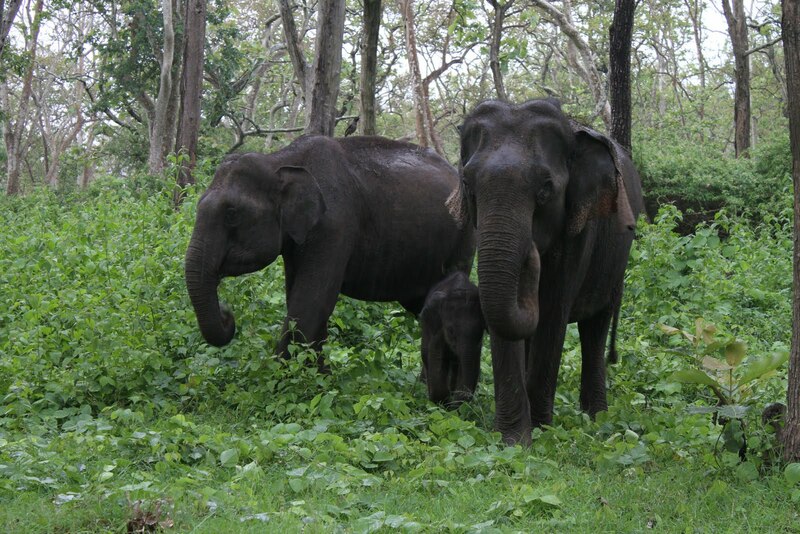 It is contiguous to Madhumalai Wildlife Sanctuary in Tamil Nadu state to south and Wynad Wildlife Sanctuary in Kerala state to the south-west.To the north-west lies Nagarhole National Park. The highest peak is Gopalaswamy hill. National Park of Karnataka. The Kabini reservoir provides water facility and the grazing ground on the foreshore, for hundreds of elephants during severe and prolonged pinch period. Seasonal streams like Wadli, Chammanahalla, Aidasanahattihalla, Hebballa, Warranchi, Chippanahalla and Mavinahalla are also present. 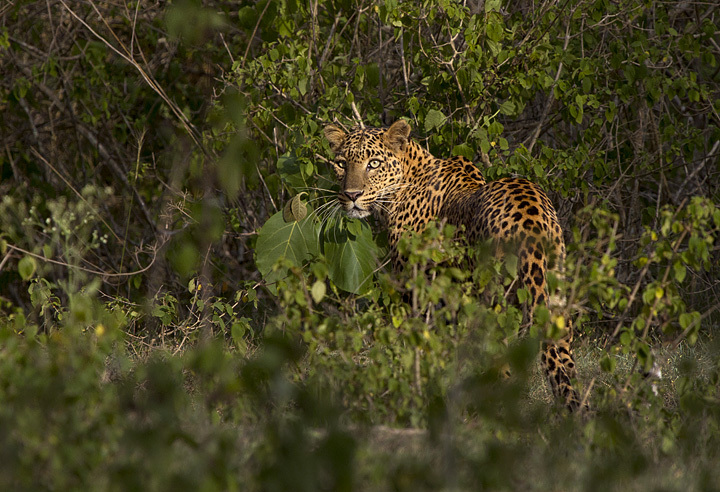 Bandipur lies in the southern state of Karnataka and covers a forest area of 865 square kilometers. It was declared a National Park in 1974 and is one of the original 9 tiger reserves under the watchful eye of "Project Tiger". 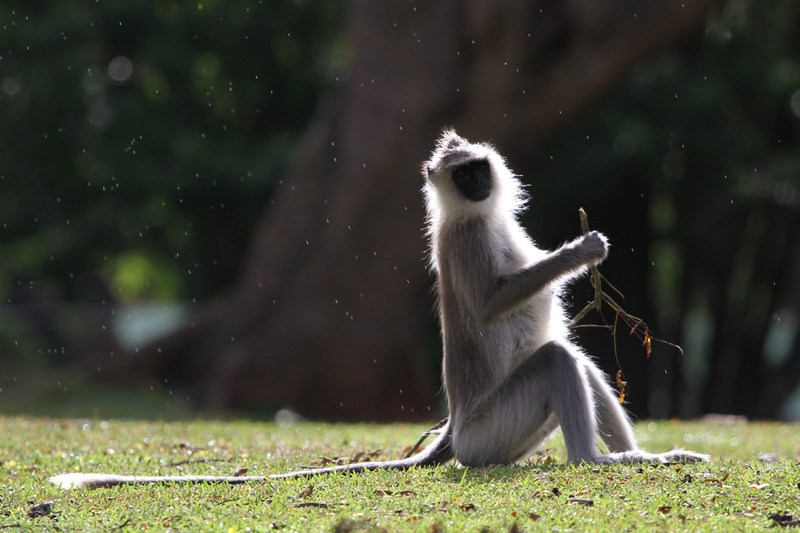 Bandipur National Park begins to blossom with all its beauty due to the arrival of pre-monsoon showers in April. 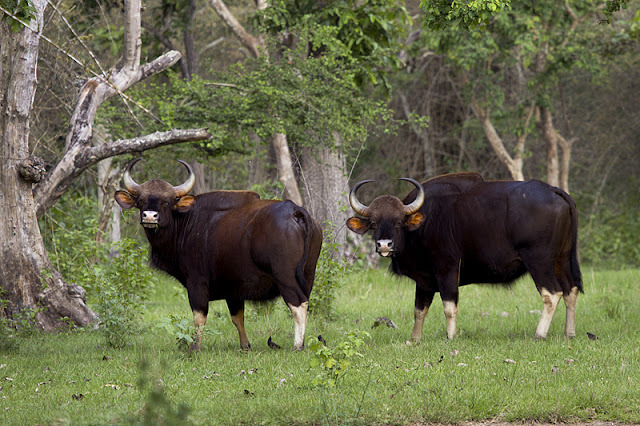 The grasslands with developing grass are dominated by elephants and the majestic gaur. Bandipur is a paradise between Aprils to October, for the tourist coming to watch the larger mammals in their natural habitats. During the summer season, when dryness exists over most parts of Bandipur, the backwaters of the Kabini Reservoir in the northwestern part of the park entertains huge gathering of large mammals, especially the elephant and the gaur. This rare character of Bandipur National Park makes a breathtaking view, and is almost the only one of its kind in Asia . Dry deciduous scrub, Southern tropical/Dry deciduous & Southern Tropical Moist Mixed deciduous forests cover the reserve area. Tiger, Leopard, Elephant, Gaur, Sambar, Spotted deer, Sloth bear, Mouse deer, Wild dog, four horned Antelope can be spotted in Bandipur National Park . Common Vabbler, Wood Pecker, Warbler, Weaverbird, Kingfisher, Drongo, Fly catche, Hornbill etc. Tiger, Four horned Antelope, Gaur, Elephant, Panther, Sloth bear, Crocodiles, Mouse deer, Python, Osprey, Pea fowl. Over about 1000 elephant's roam through the park and it also harbors a wide variety of other animals, reptiles and birds. Morning 6:30 AM to 9:00 AM. Evening 3:30 PM to 6:00 PM. First Trip: 6:30 AM to 9:00 AM. Second Trip: 8:00 AM to 9:30 AM. First Trip: 3:30 PM to 5:00 PM. Second Trip: 5:00 PM to 6:30 PM. Rs.3500 per Jeep (maximum six people allowed). Here are some of the list of premium, luxury, budget hotels and resorts for your comfort accommodation in Mudumalai. Gopalswamy betta (Hill) temple is located at 21kms from Bandipur National Park . A god by name Venugopala shrine atop this hill. Perfect photography. It gives me immense pleasure visiting your post. Keep up the pace and keep photographing. Nice write up. Can you please provide me with any contact number for the Sumo/gpysy safari. I will be visiting Bandhipur next week and would like to take a private jeep safari. Please mail me the details to bhharan@gmail.com. It would be great help to me. hi! KINGS KOURT Hotel, we needn't say much, just a few words, "it's the best and only the best" with 56 centrally air conditioned rooms furnished to international standards. We've looked into every detail to make your stay as flawless as possible. 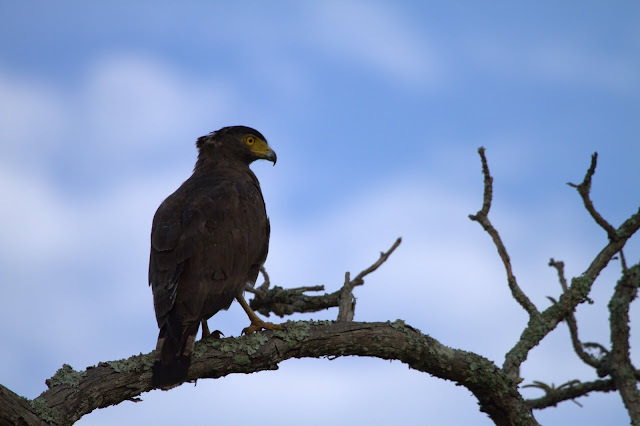 hi……nice blog.Thank you for sharing such a beautiful and important information of Bandipur Holidays in India .Bandipur National Park is one of India’s best known sanctuaries,and is an important Project Tiger reserve. 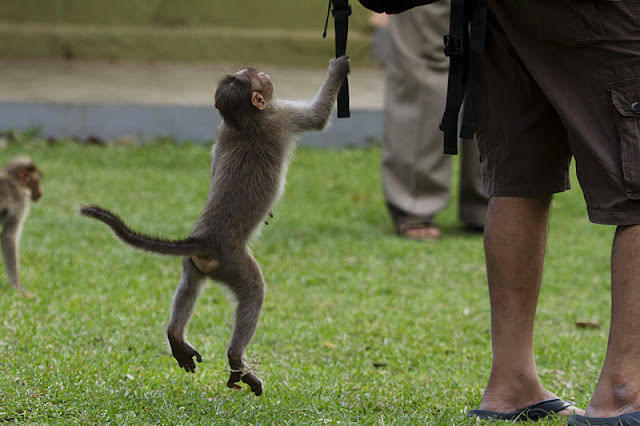 Hi very good Blog.Information of bandipur resort is very useful for every tourist. Nice post keep posting....Bandipur national park is great place for wildlife lovers. there are many good Wildlife resorts in Bandipur, and mc resorts is one of them. Images shows the beauty of Bandipur resorts. 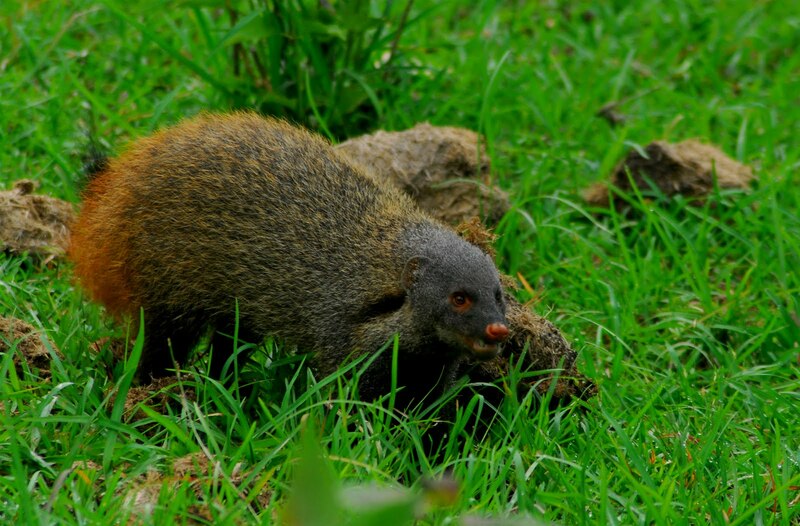 Pictures exhibits the radiance of Bandipur Resorts. Thankful concerning offering such an unfathomable information. You've gone into superb detail about the place. Just the kind of info I was searching. Actually, visiting Bandipur this winter. hiii really brilliant informational you BlogSpot of Rajasthan Wild life tour package. Really watch face to face really tiger its amazing view and your BlogSpot designing also superb. That’s main reason large number of tourists visit to wild life in Rajasthan. Very nice blog! Loved reading it and the pictures are beautiful. It seems Hotels in Bandipur are good and offer perfect picturesque view. Thank you for this amazing blog with wonderful pictures. Bandipur is a must visit location, located in Gundlupet taluq of Chamarajanagar district. On the route to a major tourist destination of Ooty, Bandipur sees a lot of tourist traffic and there are many places to visit in Bandipur. It has a wide range of flora nad fauna and is ideal for wildlife lovers. Great trip!! its really awesome place to visit, thanks for sharing this informative post in your blog. Loved reading this blog. Book your bus tickets in Online Bus Tickets Booking portal and explore to those places. Wow great place. Awesome click. The Jungle Safari is an incredible chance to encounter the pith of this place and welcome the humungous measure of vegetation spread over.